Has the horrible menace known as flood and water damage been in your home or business in Santee, California? Are you tired of worrying if the problem will get better? If so, then call the professional water damage remediation specialists at Superior Cleaning and Restoration, Inc. We are here 24/7 to handle your water damage emergencies. With all roads leading to Santee in San Diego, it is important to have professionals in your pocket for any problems that might arise. We work with you from start to finish, from the initial dry out to reconstruction. Do you have commercial propery suffering from water damage? No problem. The experts at Superior Cleaning and Restoration, Inc. can handle your problem. Should I try to fix the flood and water damage myself? If there is actual damage, then no. It is imperative to get a professional to look at the situation before moving forward with any flood and water damage remediation. The reason is because if you improperly repair the damage, or miss a larger problem, the damage can return. 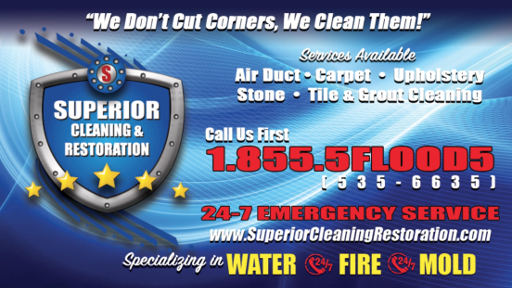 Call the remediation experts at Superior Cleaning and Restoration, Inc. for a free quote now. Let the experience of our professionals take over your disaster and rest easy knowing your property will be restored to a superior state. How often does Santee, California flood? Not very often. But this is why you should be prepared by knowing the professionals at Superior Cleaning and Restoration, Inc. are available at the drop of a hat to remediate your water damage problems. Santee, California is a great place to live. We have a nice arid climate and enjoy pleasant weather year round. Flood and water damage is usually the least of our worries. But when this menace rears its ugly head, you can rest easy knowing the professionals at Superior Cleaning and Restoration, Inc. have your property under control. From dry out remediation, to reconstruction and remodeling, no matter what level water damage you are suffering, we can fix it. We will leave your property in a superior state. Call us now for superior service in the Santee area.